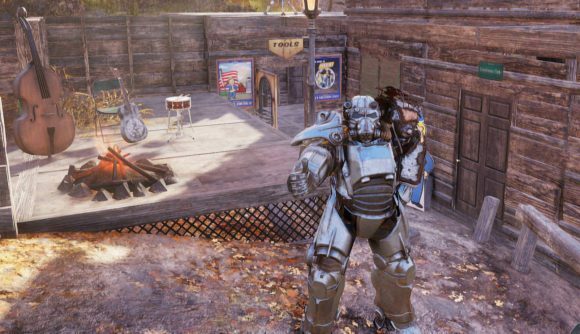 An epidemic is apparently spreading among Fallout 76 players: they’re all being very nice. Yes, contrary to everything the internet has taught us, it seems that taking Fallout online has in fact made everyone less likely to be assholes. Anecdotally, everyone’s miked up and chatting politely, and some players are even acting as helpful guides and service-givers – basically NPCs in this NPC-free game. Some are opening up welcome centers for new players, taking advantage of early grinding from the beta to craft free weapons and armour. YouTuber Many A True Nerd is one such good Samaritan, and his video (which you can see below) features perhaps the most improbably polite online interactions I have ever seen in my life. As noted by The Verge, that’s not the only welcome area kind players have built. Omnispycho on Reddit has built another place for new arrivals to gather outside of Vault 76, and that spot serves as our header image above. Another Reddit thread is titled “My weird experience so far: Every player I’ve come across has been super friendly, used the mic and has had helpful information or just general nice things to say.” It’s filled with further anecdotes about the general friendliness of Fallout 76 players. One example had somebody offer to clear a bounty for another player. Yes, that means they shot the wanted player in the head and claimed the (modest) reward, but at least they asked permission first – and the friendly transaction left that hunted player no longer subject to the whims of bounty hunters. Naturally, there are still folks out there who want to murder you and take your stuff, but all the concern over Fallout 76 griefers seems to have been overblown. For now, at least – we’ll see how player behaviour evolves in the weeks to come as more and more players filter into the wasteland, but at least they’re getting a friendly introduction to West Virginia.